The green level introduces you to standing correctly on your skis, starting from a good stance and equipment check, to how to transfer weight and tip the skis on edge, then balance on them while they do the turning for you! 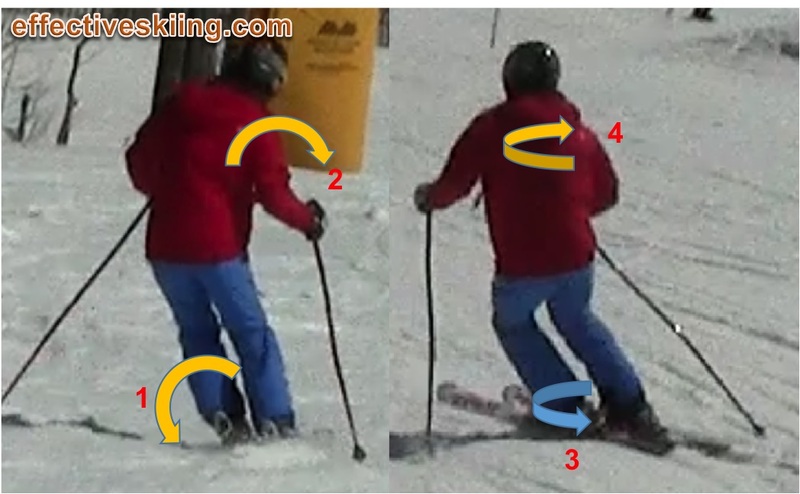 Our journey to expert skiing starts with the green level, no matter how advanced you are, so you understand the dictionary we'll be using and the basic movements and skills, all captured in the photo below: the boots and skis tip and turn one way while the body tips and turns the other way! At the end of the green (expert) level you will be carving green runs with expert movements, in great balance and control. You may spend just a few runs or a few days here. If your current skiing is really good, you could progress to the blue level in just a few runs. For most though, it will take a few well spent days: remember, you are not just learning how to conquer the green runs, but are learning how to ski effectively and erase non-effective movements! The point of the green level is to get you started and not to add something to your skiing, but rather to remove from your skiing everything but the basic effective movements, in their simplest form. So, please don't try to add something, optimize movements, execute more than we ask... the simplicity and very limited set and range of movements here serves a purpose in itself. We'll build some awareness of upper and lower body, present a basic dictionary and make sure we can glide on green runs with the proper effective movements. We are tipping the skis on edge from the feet and ankles and, once tipped on edge, the skis will turn due to the sidecut and ski design and we will be balancing on the skis with the upper body. We do not twist the skis or our body to turn the skis, just patiently wait for them to turn. This will get you to the "green level" which basically says you know to ski green slopes with effective movements. If you went through the progressions and drills properly, you have also corrected a lot of the bad habits you may have had and improved your skiing already! That's all there is to it: add nothing! Again, this level is as much about removing movements from your skiing as it is about adding. If you are indeed a new skier, without many bad habits, you're already ahead! Intermediates and advanced skiers alike will benefit from the focus on removing/quieting any unnecessary movements and adding some much needed upper/lower body separation. As long as you realize that we don't actually know what you're doing right now... so we can't really tell you what not to do, you'll understand that you have to make sure you only do what we ask and refrain from everything else. When you take and review your videos, compare with our reference and focus on removing any extra movements. We may add some back, but for now we have to decompose and remove. So, to effectively learn ski control, inputs and responses, we will avoid pivoting the skis when flat, but learn and refine the smaller specific movements of the legs that we make to cause the skis to turn, starting with tipping and separation. The reason to stay on the green runs and at low speeds right now is to make it easy to focus on the practice and the movements and to give your brain a chance to register and focus on the feelings it receives. If the speeds were higher, the speed would keep your brain so busy with decisions and feelings that there would not be enough capacity left to focus on learning new things. This is one of the ways excessive speed slows your learning. So, we'll take it easy and relax, giving your brain the opportunity to learn quickly and efficiently and, as your confidence level is boosted by the newly acquired level of balance and control, don't worry: we'll pick up the pace. Another thing to note about speed is that speed hides deficiencies. As you'll see later, speed helps bend the skis and get over incorrect movements - by taking the speed out of the equation, we'll be able to focus on the technique itself. To start this level, you can stay on top of the (somewhat parallel) skis and glide down in some shape or form, stopping as needed. We don't currently have good material for newbies that are putting their skis on for the first time - we're working on that! I can stay on top of somewhat parallel skis and glide down, in control. I can stop as needed. Viewed 887 times ( | Print ) this page.